One of the more interesting stats highlighted in the data session of the Tourism Summit was the perceived value of a Bermuda vacation measured by air exit surveys. 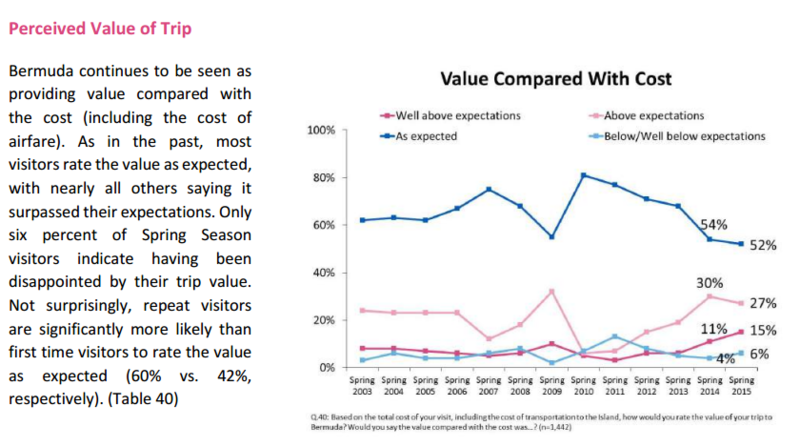 42% of people rate the value of Bermuda vacation as higher than expected, 52% rate it as expected, this is including air visitors. This is an interesting metric that was primarily mentioned in passing but is of alot more importance than it is given credit for. Many Bermudians believe that one of our biggest problems is that we don’t offer value for money when it comes to tourism and the reason why tourism suffers is because we’re too expensive of a destination. This metric from the exit surveys seems to indicate otherwise, that the value we offer is not a fundamental problem. One of the key takeaways from the summit was that awareness of Bermuda as a destination is very low and that this is a primary cause of our struggling tourism industry. Thus raising awareness is a core focus of the Bermuda Tourism Authority. It is an interesting point and warrants further reflection. Insurance industry heavyweight Brian Duperreault expressed his dismay regarding reports from US studies that few millennials are interested in careers in insurance. Honestly, it isn’t terribly surprising. The motivations that attracted generation X and baby boom workers aren’t the same that will attract millennials. Put simply, the work environment has drastically changed and millennials have a different mindset than those that came before them. Among the many changes required, businesses looking to attract and retain millennials will need to offer a clearer and more guided path of advancement and achievement than is presently available. In order to understand why changes in approach are needed it is useful to compare millennials to previous generations. Baby boomers, for example, worked in a time of far more job stability. It was not uncommon for a boomer to expect to spend most of their career working for one employer. Career advancements came in the form of leveraging job stability, on the job experience, employer training and the opportunity to climb the corporate ladder. Opportunities were usually available within an organization, often through seniority. Companies were happy to invest in employees because jobs and skillsets did not change too often. Gen Xers have worked in a time of less job stability but more career stability. They would often follow one career path for a lifetime. Career advancements came in the form of on the job experience, job training and focus on getting the experience necessary to laterally move to a better position with another organization in order to climb the ladder. Companies began to invest less in employees because jobs and skillsets began to change more often. It became more convenient to hire experienced workers from other firms rather than invest significantly in your own. Millennials are facing a different age of less job stability and less career stability. Millennials have grown up in an age of technology, change and rapid innovation. Skillsets today are ones that often need heavy investments in ongoing training and sadly may be obsolete very quickly. On the job experience counts for less and employers are not very likely to offer you lifetime employment unless it comes with limited or no advancement. Millennials face a prospect where many jobs expect you to already be trained and have existing experience to do the job. These same companies are reluctant invest in training or mentorship themselves, preferring to hire trained and experienced people off the shelf. Companies are uncertain whether their investments in their employees will payoff as jobs and skillsets can change very frequently and those they do invest in might jump ship for a better opportunity. It is a double edged sword as millennials are left struggling with how to advance while not getting the guidance and support they need to do so. It is important to understand that millennials grew up with a very different environment and thus mindset towards goals and achievement. Millennials are the Nintendo/Playstation generation. Trained from a young age by video games and the link where you had a good idea what the end goals were, what achievements you needed to get to get there and the accolades you got for doing it. Gamification is the buzz term for applying it elsewhere. A path of clear achievable objectives to accomplish in order to advance to the next level was always available. This is what millennials are most comfortable with. Contrary to mistaken belief, this doesn’t mean an expectation that things are to be easy and achieved without hard work. Millennials are just as capable of working hard as any other generation, their context however is different. One of the problems is that millennials simply aren’t like previous generations. You can’t simply say “jump” and expect them to ask “how high” because simply few believe that the kind of safety nets that were around for previous generations will still be there. As technology takes greater prominence jobs are becoming more transient and often heavily skill dependent. When employers expect to be able to hire skillsets and experience off the shelf one can’t simply gamble their future and career on their employer’s say so. You can’t simply point at executive roles and say “this could be you” and expect millennials to jump, willing to work endless evenings and weekends and constantly sacrifice for the eventual prospect that one day you’ll be ordained, but who knows when. Where are the results? Where are the points, achievements and accolades that indicate progress towards the goal? Instead advancement needs to be thought of like a ladder. If “Z” represents the CEO position and “A” represents entry level, you need to explain steps B through Y required to get there, and how you can get there faster in clear sets of achievements. Not every millennial seeks to climb the entire ladder but most do seek to know what it takes to get to the next level if they’re expected to put in the effort. Even companies like Goldman Sacks are having to adjust their approach based upon this realization. There are many factors that will attract and retain millennial employees. Training, mentorship and guidance are certainly some of the key ones. Companies can’t simply expect that what worked in the past for previous generations will work with millennials. Millennials grew up with a very different mindset and in a very different environment. The challenges facing millennials today provide far less job and career certainty and security than existed in the past. Thus companies that want to capture the best of millennial talent need to adjust their practices to provide the kind of environment in which they can thrive, the kind of environment they’re accustomed to. Do that and you’ll empower them to accomplish great things for your business. Shipping is a great indicator of an economy’s health and future. An increase in imports can mean stores are ordering more due to improved sales, builders are ordering more supplies due to projected or actual increases in demands and more people are moving things in. Thus today’s articles suggesting a 3.9% increase in container volumes and the investment in a larger faster ship are positive indicators. Rather unfortunately, container volume statistics aren’t readily available via stevedoring.bm or any government website. 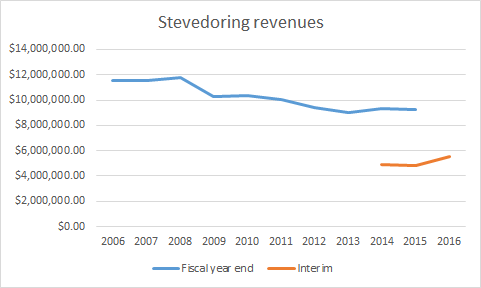 I’ve written the stevedoring company to request them but in the meantime we can look at stevedoring revenues for a better picture. We can see fiscal year end vs. interim numbers available via the BSX financial statements. The interim numbers represent a mid year measurement of revenue. The uptick we see for 2016’s financial year is a good sign. Interim numbers appear to represent just over half of the year end numbers suggesting a similar spike in year end numbers can be expected if trends continue. The interim revenue numbers have jumped by about 14%. If we see a similar jump in the fiscal year numbers that will represent a return to 2009/1010 shipping volume levels. Quite a good sign of improvement in the economy, finally. Bermuda wants to create new industries, another economic pillar upon which to stand, but we can’t largely by our own doing. Today’s article regarding an online taxi booking service illustrates why. We’re too far behind the curve on most things. Government gets far too involved because of our bloated civil service. We focus too much on protecting the status quo and a sense of entitlement to the way things are. All of these factors act as significant roadblocks to disruptive change. Disruptive change is what drives innovation and this is why in many ways Bermuda isn’t innovative. A spokesman for the Ministry of Transport said that a review was now under way in tandem with the Attorney General’s Chambers, examining the legal implications of taxi apps — including Uber. Number 1: We’re too far behind the curve. Why are we so far behind on this? Uber and related taxi apps have been around for years now and a review is only now under way? According to the ministry spokesman, “significant progress” is under way to move toward “a central dispatching system, in consultation with the local dispatching companies, that will utilise many of the current technological applications that are available”. Number 2: Anytime the government claims “significant progress” is a bad sign. This has been talked about for years and still no resolution. If anything, government is too involved and is doing more to prevent progress than make it. “It puts the dispatch company out of business, or hurts their business, and you have to get the taxi drivers to buy into it as well as the public. Number 3: Protectionism to the point of self injury. This is one of Bermuda’s worst problems. We’re too entitled to and protective of the status quo. Taxi drivers are rampant against any sort of change to the industry despite well known inconsistent sometimes brilliant, sometimes terrible service. In nearly the same breath you have a Taxi Association President proclaiming that taxi drivers are struggling for work, waiting 3 hours for a job and then raising concerns that dispatch could have competition. Dispatch as it stands now does not work if it takes 3 hours of waiting at the airport to get a fare. A properly functioning dispatch system would better assign available drivers to available jobs. There are too many antidotes of drivers that show up late and passengers who gave up waiting. A proper dispatch system would resolve this. What should happen is that these entrepreneurs should be supported. An America’s Cup style red carpet should be rolled out for them to streamline all of the impediments. If anything, these guys should be supported to help supply the existing dispatch companies with software to tap into taxi tracking and dispatch. Just because there’s an app doesn’t mean the end of dispatch. An app requires knowledge about it, it requires downloading, it requires data. Many people would be happy to just have a phone number they can call that they get a reliable response and estimate rather than “on is one the way” but who knows when. Government’s should be happy that they’d get a means to keep tabs on drivers who refuse fares and properly regulate the industry. Taxi drivers should be happy because they’d no longer have to sit around for hours waiting to pick up a fare. This is why Bermuda struggles to innovate and lags behind most everyone else at ths point. We have to take calculated risks and get ahead of the curve. Government needs to be less hands on and more of a regulator and facilitator. Finally, we need to shift our mindset away from protecting the status quo. Bermudians like those who created this app should be applauded, supported and empowered to bring forth disruptive change and innovation. If we don’t start doing it now, we’ll never innovate. What is the cost of the proposed new airport? The Royal Gazette posted an article suggesting opposition to higher airport fees as a result of the proposed new airport. This writer is no fan of increasing departure taxes further and would like to see ways to cut spending to reduce taxes. That being said, it is important to consider what the actual fee increase might actually be before standing for or against the project. Thus, here’s a back of the envelope calculation to try to get an idea of what the costs could be. = 7.14 million a year in fees that will need to be recouped. A question posted in response to this calculation was whether this would be over and above the existing $16 airport improvement fee. This does raise an interesting question. Does the existing airport really cost $16 per passenger to maintain, approximately $6 million a year? Are we looking at phasing in the fee for the new airport only once it is complete? If so, will the actual fee rise we see amount to $3? What about the other departure taxes levied? Is it really necessary to maintain those at such an excessive level? If anyone knows more accurately what we’d be looking at in terms of costs and how we justify them their input is welcome in the comments section.